A grand sextile pattern is also often referred to as a Star of David pattern. A grand sextile pattern occurs when 6 planets are placed in 60 degree angles from each other and thus forming the Star of David pattern. In addition to this data, Sirius 1.3, which was used to do this analysis, produces a graph of the results. Shown below is a graph when 5 planets, not including the Moon, are at 5 points of the grand sextile pattern. Because the Moon moves much faster than other planets, one may wish to see when 5 planets come are at 5 of the 6 points of a Grand Sextile pattern. If the Moon moves into the 6th point, then a grand sextile pattern is formed. The height of the lines indicates how close the orbs are and how many times a 5-planet pattern occurs. For example, if 6 planets form a grand sextile pattern, then there will be many 5-planet patterns and the score will be very high. Also, if 5 of the 6 points of the grand sextile pattern are occupied with a planet and one or more of the points are occupied by two planets that are conjunct, the score will be higher. The graph shows when the patterns are occurring and how strong they are. Fig. 1: Planets are at 5 of 6 points of a grand sextile, 1900 – 1999. Fig. 2: Planets are at 5 of 6 points of a grand sextile, 2000 - 2050. 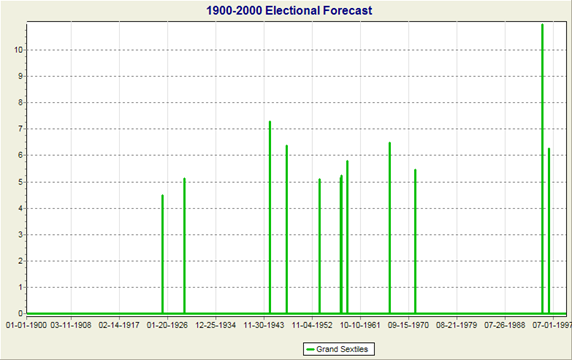 As we can see from the above graphs planets move into grand sextile aspects sporadically. 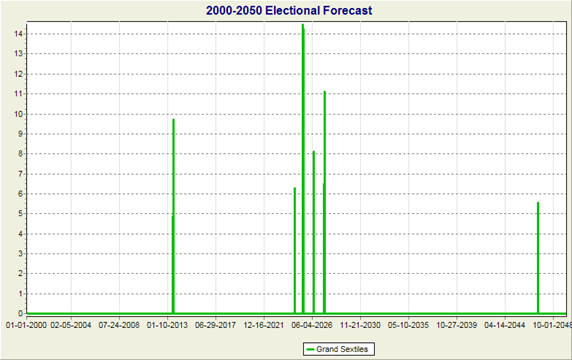 I thoroughly analyzed grand sextile patterns through the year 2025, but it appears from the graph in Figure 2, and also in the data presented in the Appendix, that there are likely to be grand sextiles in 2026. Children born at these times have a "Star of David" pattern in their birth charts. This might seem to be very special. It is certainly very unusual. Did something occur in world events that was similar during these three time periods? Was there somthing special related specifically to the planets involved, the signs that they were in and rule? There are many schools of astrology and many approaches to astrological interpretation. Astrologers with different points of view now have this data available to interpret. The analysis could be done again with different orb, and including asteroids if desired. SIRIUS.3 from Cosmic Patterns Software (http://www.AstroSoftware.com) was used to obtain this information. I am one of the programmers of Sirius and I added a feature to Sirius to assist in obtaining these results. Owners of Sirius who wish to conduct similar research can install an update to the software. In the Electional Astrology Graph feature of the Sirius an Kepler software one can select 3 or 4 planets in a harmonic configuration. This feature allows us to greatly narrow down the number of possible times that a grand sextile occurs, but still requires manually going through the data to see when 6 planets are in grand sextile aspect. I added a feature to drastically reduce the amount of time needed to find the grand sextile patterns. There are four new features: (1) Up to 5 planets in a harmonic can be analyzed. Previously only 3-planet and 4-planet patterns could be identified. Now 5-planet patterns can be identified. (2) It is now possible to search for specific patterns such as grand trines, T-squares, grand crosses, and 5-planets at 5 of the 6 points of a grand sextile pattern. Previously one could find, for example, 4 planets in 6th harmonic and one could choose whether to remove lower harmonics but when 4 planets are sextile to each other, there are always lower harmonic aspects! This is true with just 3 planets. In a sextile-sextile-trine pattern, the trine is a lower harmonic aspect. It is impossible to have 3 planets sextile to each other without one of the aspects being a trine. Consequently, the feature of being able to find harmonic patterns that do not include lower harmonic aspects was not helpful for finding grand sextile aspects. If, for example, two planets are conjunct and these two planets are sextile two other planets that are conjunct, the four planets are in 6th harmonic, but not even close to being at 4 points of a grand sextile pattern. (3) It is now possible to include up to 10 asteroids in the analysis. (4) The strength of the pattern can now be based on an average of the orbs between the planets so that a pattern that has smaller orbs has more points than a pattern with smaller orbs. This strength is referred to as a proportional orb because the strength assigned to the pattern is proportional to the size of the orbs. The “5” after “HAp” indicates that a 5-planet pattern is being analyzed. The bold blue “N” indicates that the Moon is not included. The first bold blue “P” indicates that patterns are searched for. Because this is a 6th harmonic pattern, Sirius searches for 5 planets at 5 points of a grand sextile pattern. The second bold blue P indicates that proportional strength is used. Proportional strength determines the strength based on the average of the orbs between the planets; otherwise the maximum number of points are used. The other values in this line are set by the selections made or are not relevant to 3-planet, 4-planet, and 5-planet patterns. After making these changes, you can run the analysis to obtain the data that is shown in the Appendix. In the list of details that is produced there is a check box to remove the items that have a score of zero, which is most of the dates because the 5-planet sextile patterns occur rarely. This appendix is primarily provided in case you wish to verify the results obtained. Probably most readers can skip this appendix. Given below are the non-zero results for 5 planets in sextile aspect. The results are presented in sections separated by a double-dashed line. Within each section are two sets of results separated by 3 dashed lines. The first of the two sets of data in each section shows the 5 planets that are in sextile aspect to each other on a given day. These planets form 5 points of the 6-pointed grand sextile pattern. The Moon is not included in this analysis. There are 9 planets considered in this analysis: Sun through Pluto, except for the Moon. Calculations were performed one time per day. The 5 planets that are aspected are listed followed by the size of the maximum orb. Note that the orb given is the orb in the 6th harmonic chart. To obtain the orb in the natal chart, divide this number by 6. Then in parentheses the planets are listed again with the number of degrees (rounded to the nearest degree) separating the planets given. On March 2, 1925 the planets Sun, Pluto, Saturn, Jupiter, and Mars were in sextile aspect to each other and in 5 of the 6 points of the grand sextile pattern. The largest aspect has an orb of a little less than 5 degrees (1/6 of 28 degrees). The orb of the Sun-Pluto aspect was nearly exact (1/6 of 1 degree), the orb of the Pluto-Saturn aspect was about 3 degrees (1/6 of 16 degrees), etc. To verify these results, we can enter birth data for March 2, 1925 at any time of the day. I entered 12 noon and a place of London, England. We obtain the following positions: Sun = 11 Pis 25, Pluto = 11 Can 31, Saturn = 14 Sco 15, Jupiter = 15 Cap 49, and Mars = 16 Tau 08. These results confirm the results shown above. Below the 3 dashed lines is the analysis for the days on which at least 5 planets were in grand sextile aspect. This analysis is produced every 3 hours and the Moon is included. To prevent this appendix from being unnecessarily long, only the relevant and strongest results aer shown. On May 2, 1925, the 5 maximum orb of the aspects reached its minimum value within an hour and a half (i.e., within the 3 hour span) of 16:00 GMT. If a grand sextile occurs, there will be several 5-planet patterns forming at the same time. A number of points is given. This is not needed for this study and we ignore the points that are assigned. Points are useful when several astrological variables are included in an analysis but in this study only one astrological variable, the 5-planets in a grand sextile configuration, is analyzed. Observations that I made about some of the patterns is italicize. There are two 5-planet patterns but Moon is conjunct Mars so there is not a grand sextiel pattern. There are two 5-planet patterns but Moon is conjunct Jupiter so there is not a grand sextile pattern. There are two 5-planet patterns but Moon is conjunct Pluto so there is not a grand sextile pattern. There are two 5-planet patterns but Moon is conjunct Mercury so there is not a grand sextile pattern. There are two 5-planet patterns but Moon is conjunct Mars so there is not a grand sextile pattern. There are two 5-planet patterns but Moon is conj Sat and Ura conj Nep there is not a grand sextile pattern. There are two 5-planet patterns but Moon is conj Sat and Ura conj Nep there is not a grand sextile pattern (since late on the previous day). There are two 5-planet patterns but Ura is conjunt Nep and there is not a grand sextile pattern. There are two 5-planet patterns but Venus is conjunct Mars so there is not a grand sextile pattern. Despite the huge number of 5-planet patterns listed, there are 3 conjunctions which cause these multiple 5-planet patterns and there is no grand sextile pattern.